Lofts originated in New York during 1970s and early 1980s. At that time New York had many unused industrial and office buildings, which were transformed into condominium apartments. That trend migrated to Toronto in the early 1980s, when the first Toronto loft conversion took place at 41 Shanly Street. There are two categories of loft apartments. Authentic loft conversions, or hard lofts, are created from existing industrial or commercial buildings. Such units are considered renovations, and are not covered by Tarion warranty. Their attractiveness is due to, in part, old features that these buildings retained: incredibly high ceilings, wide staircases, multi-paned metal framed windows, huge wood beams, concrete or old wood floors, to name but a few. There is, though, just a limited number of these old buildings available in Toronto, and some of the locations are not really very attractive, or not handy to the public transit system. For an almost complete list of Toronto loft buildings please check TORONTO LOFTS. Because of the popularity of loft apartments, as the older buildings have become harder to find, some brand new lofts are being built in Toronto since 1995. There is a distinct difference between the old and the new. New loft buildings have more modern facilities, insulation in the walls, double-glazed windows, but usually lack the great ceiling heights of the old buildings and their old rugged charm. Lofts attract the urban home buyers, and, as their prices tend to be more expensive than the traditional condominium units, majority of loft buyers are professionals, with good income. From the outside, many loft conversions look reassuringly solid. A good loft conversion is one where the developer acted with minimal intervention, revealing the building, rather than transforming it, to allow the owner to create their own environment. The shape of an apartment in a big factory building may be unconventional. Buildings that were not designed for habitation present a challenge to bring into satisfying proportions. Most of the time, however, we find that tall doors, large windows and high ceilings increase our feeling of space, even when the actual footage is restricted. 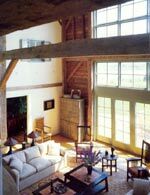 If you are on a lookout for a loft space to call your own, you can request information to be e-mailed to you as soon as one that meets your criteria becomes available. Please fill in Loft search form and we will set-up an MLS search for you. Loft sales in Toronto constitute a small percentage of the total condominium sales. There are few industrial buildings available for conversion, and the price per square foot is higher by, on average, 12% for hard lofts. A number of church buuldings have been converted to lofts - these are difficult projects, and the results are not always very successful. Some old factory buildings are still around, and will likely be converted at some point. And a number of soft lofts are being built across the city. The following are some examples of the activity in loft sales. Broadview Lofts located at 68 Broadview Avenue in E01, were registered in 2007, and 29 lofts changed hands in the building that year, followed by 25 in 2008. In 2009 23 units were sold in the building. In 2010 18 lofts were sold, three of them commercial basement units. In 2011 15 lofts were sold, one of them a commercial basement unit, selling (in 2011), on average, at 97.7% of asking, with only one sale at asking (100%). In 2007 the average price per square foot was $396, and in 2008 that went up to $409.5. In 2009 the average price per square foot was $422.0. In 2010 the average price went up to $465 per sq.ft. In 2011 the average price was $509 per sq.ft. Printing Factory Lofts, at 201 Carlaw Avenue in E01, were registered in 2010, and 24 lofts were sold that year, folowed by 35 in 2011. In 2010 the average price per square foot was $484, and the lofts were selling between 91% and 100% of asking price (on average 97%). In 2011 the average price increased to %515 per square foot, and the lofts were selling on average at 99.6% of askingprice (between 93% and 104%). In the first 5 months of 2012 10 lofts were sold averaging $525 per square foot. The average sale to list price ratio was 100.8% (between 95% and 109%). For more detailed statistical information on loft sales in Toronto, please e-mail us.